Created in partnership with our acclaimed design and draftsman, this stunning home was completely custom-designed, from the majestic entrance area to the garden beyond. With huge open-plan living and contemporary design elements throughout, this home presented a few challenges, both during the conception stage and once we had begun construction – but nothing we couldn’t overcome. 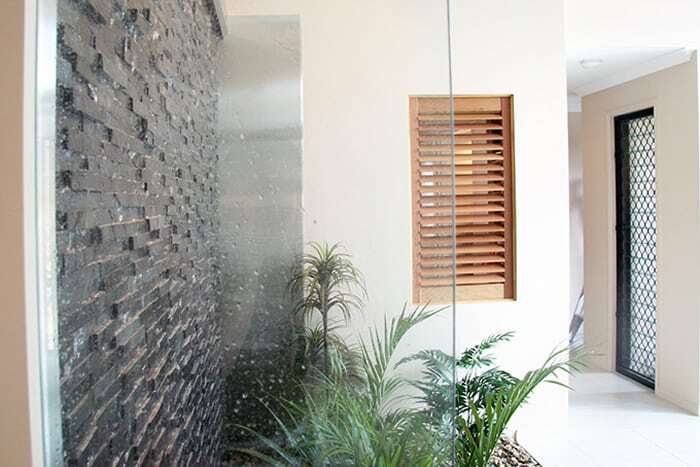 The result is a strikingly unique and modern home with a number of eye-catching departures from the norm, most notable of which is the entrance and foyer, with its floor-to-ceiling glasswork opening into an indoor foyer and water feature. Special blue-tinted glass was selected for its unique appearance and superior energy-saving and insulation properties, while the master bedroom’s ensuite was given a full glass wall, offering intimate views of the private courtyard garden beneath. The expansive living area is complemented by a large office space, which could be equally well suited as a play area, study, or family room. This project brings together a number of Mick and Z Homes’ characteristic skills, from the avant garde glasswork to the mixed-covering exterior, featuring a stylish mixture of brick, rendering and weatherboard.